Jan. 15 was a bittersweet day for Aiko Kawaratani, the owner of Rafu Bussan Inc., and her staff, for they had to bid farewell to 326 E. Second St. in Little Tokyo, the place they called home since their first relocation from First Street in 1978. Many of their long-time patrons, customers and friends came by in the fall to bid farewell to the old place, worrying that the store would never open again. So many customers came in to shop early for their Christmas and holiday needs, as no one was sure when the store was going to officially close, or if it was to reopen in the near future. After holding a big moving and inventory reduction sale, Kawaratani is pleased to announce the relocation of the store to Honda Plaza at 414 E. Second St., between Central and Alameda. It will be located between Anshindo Jewelers and Aloha Cafe at the former site of H.I.S. Travel. Going forward with the remodel of the space, the tentative grand opening date will be set for early March, which will also coincide with the store’s 58th anniversary. There is convenient parking for customers, great eateries in Honda Plaza, and the convenience of the Metro Station just a couple of blocks down. 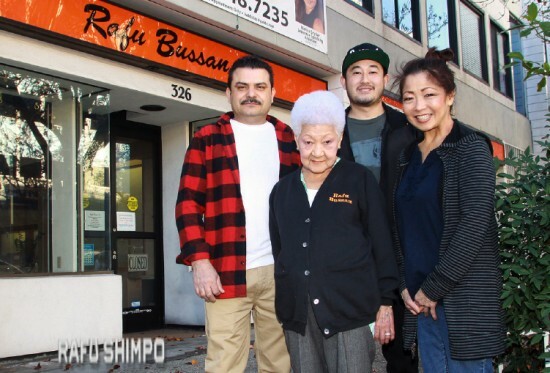 Kawaratani anticipates a great outcome for Rafu Bussan’s new home. Kawaratani and the staff were overwhelmed at the outpouring of well-wishers as the store was starting to close down. So many friends and supporters came out to help move, pack, dismantle and clean up in the final days. Kawaratani wishes to thank everyone for their concern and the many kindnesses everyone has shown these last few months.